Recommended for individuals that the employer is desiring to designate as a competent person for suspended scaffolds. In addition to meeting the City of Chicago requirement for suspended scaffold user training this course goes more in depth and has an extended hands-on component to it. The course is intended for experienced users that the employer is wanting to give the designation of Competent Person. The course is an 8-hour class that ends with an 80-question exam. Students who pass the exam with a 70% or better receive a wallet card that says they completed a Competent Person Course for Suspended Scaffolds. Students who score below a 70% will receive a wallet card saying that they attended a Suspended Scaffold User Safety Course. Note: no training course in itself makes anyone competent. Employers still are responsible to ensure that their competent people have the knowledge and abilities to recognize the hazards on their job sites. The course begins in the classroom where there is about 6 hours of instruction. The class will then build Rolling Roof Rigs with assigned outreaches. They will have to determine the number of counterweights to use on the Scaffold according to the counterweight formula. Proper installation and discussion of Primary Wire Rope and Tieback Wire Rope will be demonstrated. The class will also construct 3-meter platforms. A motor and its emergency systems will be tested and demonstrated to the students. Students who wish to are encouraged to operate the motor themselves. Finally, the students return to the classroom to take the 80-question exam. Class sizes range from 4 to 20 with the optimal size being about 9. The time for the course extends with larger classes due to increased discussion time. 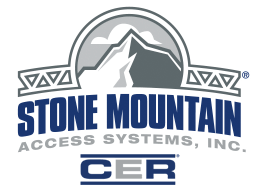 Students who complete the course receive a record of training card from Stone Mountain Access Systems which is valid for 3 years.